This movie doesn’t need to take abuse from us: it has hundreds of people dying to abuse it. Danni Glover braves the Ghostbusters remake. 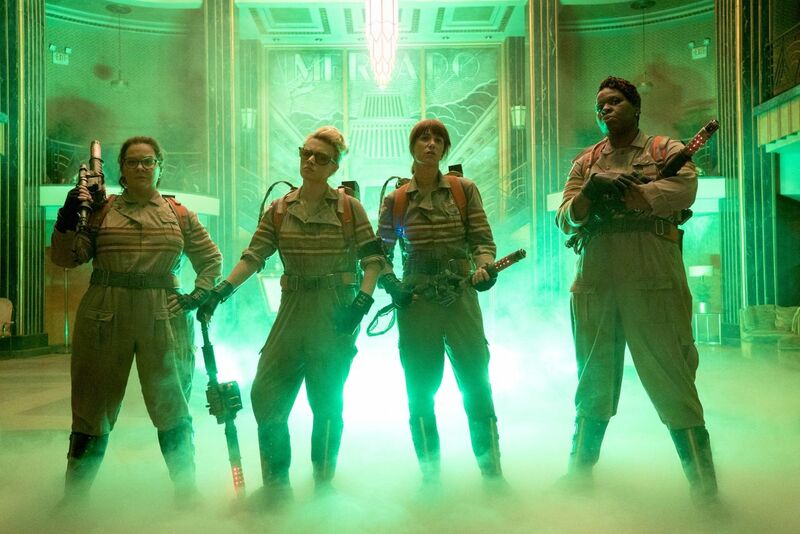 There have been a lot of Takes on the new Ghostbusters film, haven’t there? A lot of people congratulating themselves for deciding it’s garbage or the best comedy film of the year and berating each other for disagreeing. Opinions which have materialised everywhere, remarkably, in spite of the fact that nobody had actually seen the film upon which they were opining. I come to you as an anomaly: a person blogging, on the actual internet, who has actually seen Paul Feig’s Ghostbusters. Now, I’ll admit that inwardly I was desperate for Ghostbusters to be good, even just a bit good, because, like Prime Ministers, if even one lady is bad at the job no other ladies get a chance for twenty-five years. It was this impulse which led me to rise to the bait of defending the film against the temper tantrums of slavering misogynists on Facebook whenever I saw them. The upshot of which being that I’m tired of Takes. I’m exhausted. I was bored of Ghostbusters before it even began. I’m sure I’ve spent more time talking about Ghostbusters in the four months since the trailer was released than I have talking about my top five favourite films combined (Hedwig and the Angry Inch, Harold and Maude, Halloween, Female Trouble, and Hausu, if you’re interested). At this point, what more is there to say about this film’s very right to exist, that hasn’t already been foamingly screeched into the empty void of a YouTube comments section? So no Takes, then. I’m not going to talk about the fact that the culture of remakes, reboots and sequels is a little annoying and may preclude original ideas from taking up space in multiplexes, but that it’s as old as commercial cinema itself and that if the people who get so angry about them took the time and effort to actually support smaller and more off-beat films (with money) then maybe more of them would be made. I certainly won’t pontificate that sometimes remakes are really good, that the perspective of a new decade might shed some light on the themes of paranoia that the original Ghostbusters movie only scratched the surface of. I know as well as anybody else that remakes are too often cynical cash-grabs, and I also know that they work and generally make good money, which is enough reason for studios to keep making them. I’m not going to even touch the gender thing. You won’t find me wasting my time talking about how if your first instinct when seeing the cast of this film is to describe it as a “gimmick” then your instincts might be driven by sexism. I won’t implore you to consider that just as Bill Murray and Dan Ackroyd and Rick Moranis and Harold Ramis were among the funniest North Americans on television in the mid-1980s, Kristen Wiig and Melissa McCarthy and Leslie Jones and Kate McKinnon are among the funniest North Americans on television in the 2010s. Since everyone in the entire world has seen Bridesmaids, you don’t need it pointed out to you that Feig has successfully gotten an Oscar-nomination-worthy performance out of McCarthy, that Wiig was also nominated for an Oscar for that film, and that the three films other than Ghostbusters that Feig and McCarthy have made together boast collective box-office takings of $754 million; and you know fine well that plenty of directors use tried and tested actors across multiple film projects, and that if Feig has a good working relationship with these actors then that’s a good enough reason for him to employ them again for his Ghostbusters remake. It would be particularly daring to suggest that, while a remake of Ghostbusters starring, say, Adam Sandler, Seth Rogen, Kevin Hart and Jonah Hill might be met with some understandable derision based on the fact that remakes are “unnecessary”, I doubt that there would be a hate campaign mounted against it on seedy message boards. I doubt that anybody would say it “ruined their childhood”. That would be daring, and I’m tired of Takes, so I’m not going to say it. And while I’m not saying it, I’ll also keep to myself that a movie in which four women are publically ridiculed and disbelieved for talking about their personal experiences makes more sense to me than the same movie but with four men, somehow. That’s not even touching on the fact that while we’re all offering Takes on the gender thing, the enormously talented Leslie Jones is, like Ernie Hudson before her, the only Ghostbuster without a PhD (according to the DVD commentary, Hudson’s character does in fact hold a doctorate as well as an impressive military career, but these facts didn’t make it to the script: the line “If there’s a steady paycheck in it, I’ll believe anything you say,” did) goes widely unremarked-upon. She’s the only one who is expected to navigate the world of bustin’ ghosts with her street smarts and sassy banter, the only one who is black. I’m tired of Takes, so I’ll just do a review instead. Ghostbusters (2016) is good. It’s certainly worth your time if you enjoyed the original. I laughed all the way through it, as did the small children sitting next to me. It feels contemporary and fun, with the right amount of fan-service. Feig’s improv-style scripting that worked so well in Bridesmaids is less effective here; the zany one-liners of the original script suit the subject matter better. Kate McKinnon is going to be a bonafide comedy superstar. I’m not surprised that it’s good, because it comes from a good source material and good people have worked on it. By all means, miss this movie if it just doesn’t seem like it’ll be your thing, but you can miss me too if you think that loudly disliking something is a suitable substitute for having a personality. I ain’t afraid of no reactionary online sexism. Ghostbusters is on general release now.